Save on Sweaters at Nicky's Blog. Top brands include Boutique DIGGLY, ChillyPups, & woolycricket. Hurry! Limited time offers. Offers valid only while supplies last. 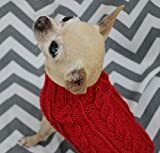 Hand knit turtleneck, long sleeve pet sweater.